The first of its kind, a new hydrogen-powered passenger train is being developed by a French company and slated to be used in Germany starting next year. 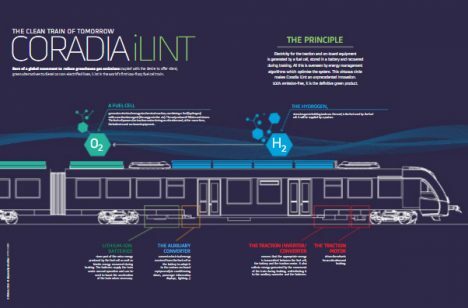 The ultra-quiet “hydrail” transit system is powered by hydrogen fuel cells that give off steam and water. The train pulls from a hydrogen fuel tank stored on the roof that generates electrical energy. The aim is to start replacing some of Europe’s diesel-burning trains, many of which still run across the continent. Alstom unveiled the new train at InnoTrans, an annual trade show in Berlin this week. The initial test set will include 14 trains of this design, with testing and approval starting later this year. Starting at the end of 2017, the train will run on the Buxtehude-Bremervörde-Bremerhaven-Cuxhaven line in the northwestern German state of Lower Saxony. Lower Saxony’s local transportation authority has meanwhile ordered 14 trains of the type. Testing and approval by the German Federal Railway Authority Eisenbahn-Bundesamt will commence in fall 2016 and is expected to be completed by end of 2017. The Coradia iLint may be the world’s first hydrogen-powered passenger train, but it’s certainly not the first vehicle to run on hydrogen fuel cells. 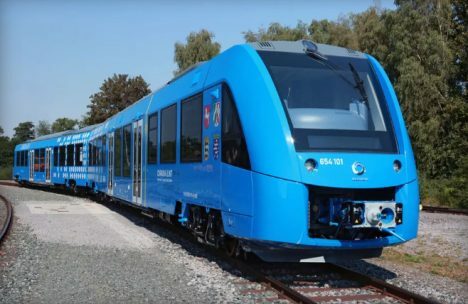 Stan Thompson, former strategic planner at AT&T and long-term advocate of the use of hydrogen for rail transportation, coined the term “hydrail” in 2004 to describe any type of rail vehicle that uses hydrogen fuel cells. There have been prototypes and hybrid trains in the meantime, most notably in Japan. 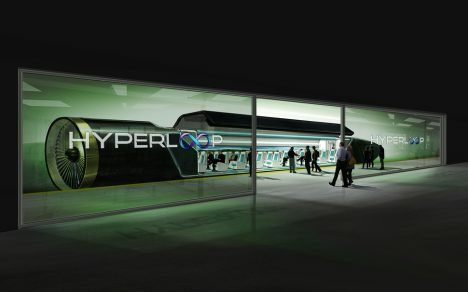 Meanwhile, Deutsche Bahn, the largest railway operator in Europe, is working Hyperloop Transportation Technologies to bring its futuristic technologies to its train fleet. As green energy initiatives go, Germany continues to lead the pack, seeking out and testing sustainable tech for mass transportation systems and otherwise. See more in Mass Transit or under Transportation. October, 2016.